is a French proverb that reflects my motto of life: “Will is power”, meaning that we can achieve everything with our will and our faith. As a young man, I led a healthy, sporty lifestyle, running my own gastro business for decades. I was never afraid of hard work, even if that entailed heavy lifting in the literal sense, often shifting weights of 50kg or more. During the winter I skied, and in the summer, I rode the waves on a water ski or a wakeboard. Unfortunately, shortly before my 50th birthday, and without any warning signs, I received the terrible diagnosis of herniated discs. It came with a paresis that fortunately didn’t last too long, but still, it was rather frightening. The Christmas of 2004 was a nightmare. I couldn’t sleep at all, because of the unbearable pain I was in. After reading the above, you may find it strange that within less than two years, I was able to ski again after defeating my slipped disc condition. Many people ask me the same question: how was I able to do sports or even walk after being diagnosed with such a condition? Well, I was stubborn enough to fight for a cure without an operation and this brought me to the idea of the Denevérpad. I was simply unable to accept that I will never be able to do my favorite winter sports again. My doctor, who became a good friend throughout the years, looked at my medical records and with deep regret he told me the diagnosis and the explained the low-key life that was to await. I stubbornly believed that the answer to my problem was NOT an operation. Thanks to this conversation and to this one particular sentence, I built the first homemade prototype of the Denevérpad, using an old pair of ski boots to hang myself from. 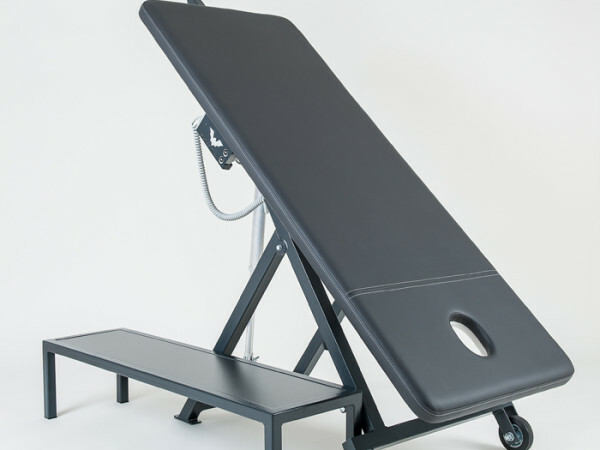 This first bench helped me to get rid of the pain and to repair my herniated discs. In the decade that followed, I devoted my life to improving this bench and I also did a lot of research on spinal disorders. Today the Denevér Method is a patented treatment across the EU. It was a bumpy ride, but like I said, everything is possible if you really want it. You can read the story of my recovery and my journey in my book – only available in the Hungarian language for now. I am humbled by the success that my invention has enjoyed in helping to treat and prevent the spinal diseases of a wide range of people. Hathatós segítség a gerincsérv ellenA Denevérpad az ATV Fő az Egészség című műsorában. Próbálja ki a Gerincdoktort!Tekintse meg rövid bemutatkozónkat! A Denevérpad az ATV Fő az Egészség című műsorában.